I’m sure readers of this blog have heard several suggestions to resolve the Zionist occupation of the historic Palestine – from Indian leader Mahatma Gandhi’s objection to West’s establishing of a homeland for Europe’s unwanted Jews, stating: “Palestine belongs to the Arabs in the same sense that England belongs to the English or France to the French. It is wrong and inhuman to impose the Jews on the Arabs… Surely it would be a crime against humanity to reduce the proud Arabs so that Palestine can be restored to the Jews partly or wholly as their national home,” Harijan magazine, November 26, 1938 (here). Father of Pakistan, Muhammad Ali Jinnah conveyed Indian Muslims’ objection to partition of Palestine during his meeting with Mufti of Palestine in 1946 in Cairo. More recently, several Christian, Jewish and Muslim intellectuals such as Helen Thomas, Gilad Atzmon, Roger Tucker, Iranian president Hassan Rouhani and many others have proposed various options to resolve the issue. But, they all agree that Palestine belongs to Palestinians. 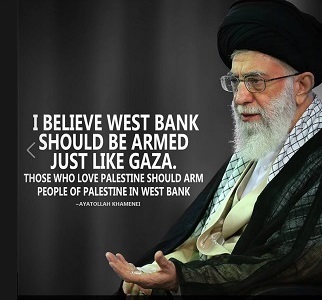 On August 30, 2012, Iran’s Supreme Leader Ayatullah Ali Khamenei made the following suggestion to resolve the Palestinian issue during his inaugural speech at the 16th Non-Aligned Summit. Our standpoint is that Palestine belongs to the Palestinians and that continuing its occupation is a great and intolerable injustice and a major threat to global peace and security. All solutions suggested and followed up by the Westerners and their affiliates for “resolving the problem of Palestine” have been wrong and unsuccessful, and it will remain so in the future. We have put forth a just and entirely democratic solution. All the Palestinians both the current citizens of Palestine and those who have been forced to immigrate to other countries but have preserved their Palestinian identity, including Muslims, Christians and Jews should take part in a carefully supervised and confidence-building referendum and chose the political system of their country, and all the Palestinians who have suffered from years of exile should return to their country and take part in this referendum and then help draft a Constitution and hold elections. Peace will then be established. I never joined Facebook – and for very good reasons ….